Students from the College of Santa Fe, the oldest college in the state of New Mexico, rallied this week to try to save their private liberal arts school which is headed for bankruptcy without state funding or other miraculous intervention to solve its $35 million indebtedness. It is not known if the school can even make it to the end of the semester. The bill to save the school died in the Senate Finance Committee without a hearing. This was the legislature's last week. This late September sunset in Santa Fe was most unusual. But I've learned to never become complacent about the landscape which, in this light, is a living and breathing entity and a larger-than-life character. No wonder the west is so mythical. This is the second weekend that the Farmer's Market in Santa Fe is open in the newly completed revitalized 50-acre Railyard, which celebrated its huge grand opening last weekend and, after the Fiesta celebrations, the entire city was excited and buzzing about the coming out party. Fall decorations -- variated colored dried corn with red chiles, pumpkins and goards are beautiful and bountiful. 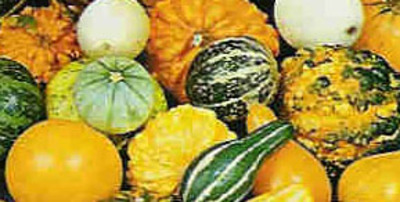 At left are calabacitas. This is when I start putting out my own fall decorations and it continues right to the new year, one rotation after another after the summer flowers wither away. The first thing in the baskets? Chamisa, in bloom in the high desert landscape. It dries and adds color. For greenery I'll throw in pine boughs in November or so. Chamisa stinks, by the way -- smells like dirty old socks. So don't stick your nose down in my decorations. The number of farmers’ markets has more than doubled since the mid-1990s. Calabacitas, a Pueblo Indian food dish, is one of the local favorites. I want to try this recipe. Heirloom vegetables are a treat and buying in season and organic when possible is the way to go and makes cooking and eating a celebration. I ran off in a hurry last week one morning with goat milk yogurt for breakfast-on-the-fly with fresh raspberries added in. Goat cheese with green chile? One of my favorite discoveries since moving to Santa Fe. Green chile can become addictive (I'm hooked). Fall red chile ristras have been hung on the portal with care and the mums add color while my herbs linger in the pots. This is the final weekend for some Hatch green chile shipments. We buy ours roasted at the Market, throw them in the freezer and they are easier to peel after we thaw them. In New York City we enjoyed roof top honey and the Union Square Market; in Atlanta we scouted out the Farmer's Markets right away. In Houston we tried the new internet-order food delivery and although we saw these delivering groceries on Park Avenue, they didn't seem to last in Houston and were out of business by the time we moved to Georgia. Going to Farmer's Markets is the way we have fun. The biggest week in Santa Fe is here, centering around the 87th Indian Market with 1,200 artists from 100 tribes exhibiting this weekend (2008 poster at left by Cochiti artist Mateo Romero). Over 100,000 visitors are expected downtown. Yesterday I went to the 30th Whitehawk Antique Indian Show, sneaking in on the last hour to get a sense of how prices are going for items and what is being shown. I saw one original Allan Houser sketch, a couple of Helen Cordero story tellers (priced at $22,000 and above) and two Harrison Begays for close to $1,000 each. I came out empty handed, determined to wear more of my grandmother's silver and turquoise jewelry since it seems more valuable now but thinking old bolos on men aren't so interesting looking anymore. Contemporary bolo ties are new forms that local men are eying and buying. Extra events are all over the place, early and late, like a breakfast with Cochiti artist Diego Romero tomorrow morning. Kachina carving is considered a dying art so there won't be much of this art form. Harrison Begay, the oldest living artist from Dorothy Dunn's Santa Fe Indian Art Studio won't be there exhibiting and his work isn't influencing new artists much anymore. Legends Gallery in Santa Fe is not alone in having events at 5:00 a.m. One of most influential artists in the Contemporary Indian Art movement is Kevin Red Star, raised on the Crow reservation in Montana. 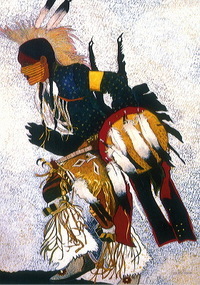 His schooling in art at the Institute of American Arts in Santa Fe was a pivotal element in his art career trajectory -- he was among the first 150 students selected in 1962 to attend the (then) experimental Native American art school in Santa Fe which has become a dynamic force in contemporary Indian art. Kevin Red Star's works, such as the one at right, have an echo of the Plains Indian tradition of flat line figurative art produced on animal hides. It was that style that was encouraged in Oklahoma by the head of the University of Oklahoma Art Department and the Kiowa Indians who then exhibited their works abroad became known internationally as the Kiowa Five. Dorothy Dunn then took that approach with her students in Santa Fe. Last year's exhibit of Pablito Vellarde's works at the Museum of Indian Arts and Culture was one of the few showcases of Dunn's students works. Some of the best original artwork in America will be showcased here. I can't wait. Time is convoluted in Santa Fe. That is what happens when you live in one of North America's oldest towns. Time is taken from the long view. Time is extended, drawn out and fluid in its flow. What else would you expect of a Spanish villa built in an area Native Americans had called home for thousands of years? 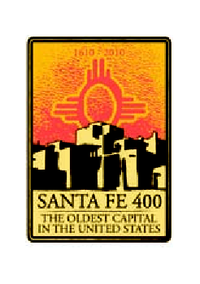 Santa Fe is celebrating its 400th anniversary over three years, starting this month and continuing through the big party in 2010. Jamestown was founded by the British in 1607, the French established Quebec in 1608 and the Spanish settled Santa Fe in 1609. As early as 1608 Spanish Conquistadors relocated from farther north in the region to what would become La Villa Real de la Santa Fe de San Francisco de Asis but now we just say Santa Fe, with the accent on the last syllable. Former New Mexico State Historian Tom Chavez uncovered documents in Spain indicating a European settlement near Santa Fe existed as early as 1607 but whatever, exactly, doesn't really matter because we'll be celebrating for quite awhile. Some people come here for arts or ambiance or the light. Santa Fe ranked #1 in number of arts businesses per capita. Somewhere between one and two million visitors come here each year and summer is the height of the tourist season. Readers of "Travel + Leisure" have ranked Santa Fe the fifth most popular travel city in the continental United States and Canada. The city was ranked fourth last year and has consistently been among the Top Ten for seven years. The top four cities were New York, San Francisco, Chicago and Charleston, S.C.
Having grown up in Oklahoma City, a town that literally went from nothing to something in a single day on the Land Run of April 1889, the experience of living in a little city with a long history is a daily delight, especially after moving here from NYC. Santa Fe's best? Hmmm. The city ranks second with the cleanest air in the U.S. and is #4 for the best place to retire and I love the mountain hiking. Last weekend I attended the 57th annual Spanish Market held on the Plaza. I'd love to collect more of the traditional Spanish colonial arts such as the Santa Anna bulto like this one, left, which is on the Spanish Colonial Museum's website for Spanish Market. I'll have to look for one at Winter Spanish Market. Best Carving Art: Last summer I went to Frankie Lopez's studio on a Spanish Colonial Art Museum tour. 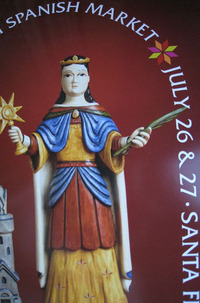 One of his carvings of Santa Barbara was selected for this summer's Spanish Market poster, right. Biggest event in Santa Fe? Indian Market, held this year on August 23rd and 24th, is the largest attended annual event (80,000 people). Santa Fe Reporter's Best of Santa Fe Awards is just out. This is such a prestigious thing here that businesses hang their award in the front windows. My favorite is one that can't hang the poster in the front window: Best Blog: Santa Fe Library Blog. Best Art? For sure Canyon Road (called the art and sole of the city). Santa Fe has the highest art-per-capita rate, even higher than New York City. The nation's oldest capital city has had the tag line "The City Different" since 1912. 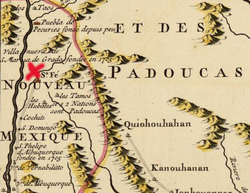 The village was on the map in the early 1700s, as shown in this section from a map by Guillaume de L'Isle, Carte de la Louisiane et du Cours du Mississipi, [1718-1730]. (click to enlarge). The season here is in full swing and the tourists, in hats, are once again filling the plaza. There is no finer fun to be had, no better place to experience mash-ups of deep cultures, no stunning blue sky and western landscape to be seen anywhere but here. It is not rare for people to come visit and have the enchantment bite them hard enough in the initial moments to decide to just come be a permanent part of this. If you haven't been, you must come. It has one of the highest concentrations of artists to be found anywhere. It is the light, similar to the South of France. Mapping here? It is still "turn right at the blue gate, take a left at the tilted mail box, go up aways and when you see the hollyhocks, you are there." I like ideas that promote heirloom foods, which are not easy to find at all anymore. Old fruit orchards grow in this part of New Mexico - not many, but they do. And local apples are one of the best things to eat around here (ok, chiles are right up there, too). French Bishop Lamy, who built the beautiful cathedral off the Plaza in downtown Santa Fe, had an apple orchard on his "country" place north of Santa Fe along a small river. Bishop's Lodge, a long-popular hotel/spa/restaurant operating on the Bishop's old property, may or may not now still have those orchards. Gary Paul Nabhan and others were concerned that they be preserved. The apples are so delicious that I find here at the Farmer's Market, and they are not like Red Delicious. Apple trees are everywhere around the river in Tesuque Village, north of Santa Fe past Bishop's Lodge. From Atlantic Monthly, Beyond the Macintosh: Apples do not “come true” from seed, so anyone who wants to taste a wild apple again must learn to graft it. The millions of seedlings that grew from the seeds colonists brought from England—varieties meant for hard cider, not for eating—gave rise to what Bunker calls the “greatest breeding experiment” in history. Johnny Appleseed, whose real name was John Chapman, did not graft any of the apples he brought with him on his treks westward from New England, because his Swedenborgian Church viewed grafting exactly as many religions today view genetic engineering: only God could create an apple. The Story Tellers are now everywhere, created in pottery by different tribes all over New Mexico. The idea of learning from our elders is a charming one and is appealing because we've lost the gist of cultural transmission through oral storytelling. Folk art is something that involves culture and community and Helen Cordero of Cochiti Pueblo in New Mexico was the first to do the pottery story tellers, commissioned by Alexander Girard to do so. 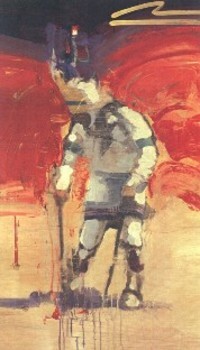 His example is in the Girard Wing of the International Museum of Folk Art. The sample at right is another Helen Cordero Story Teller in the Price Museum on the campus of the University of Oklahoma. Santa Fe's 5th International Folk Art Market on July 12 and 13, 2008 is growing to be really something incredible. Appreciation for folk art is increasing and this is one of many Santa Fe events you might want to come to. I'll be volunteering there. 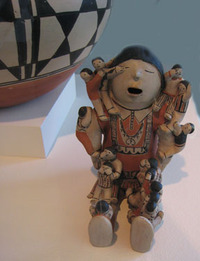 The Story Tellers are a grandmother or grandfather (Helen Cordero depicted grandfathers) surrounded by grandchildren. The role of elders in transmitting cultural values, beliefs and traditions is a powerful one. Our elders should be vital in our families and our communities. These two nuns were the only nuns I saw trekking the 20-plus miles from Santa Fe to the Santuario de Chimayo for the pre-Easter traditional celebration. This annual venture pulls thousands to journey along stations of the cross set upon the hilltops of the high desert. We have our women in burquas, too, but we're not used to seeing them on the Christians. Nunneries are in decline and there is only one nun left in Santa Fe who belonged to the Sisters of Loretto. 3/30 Update: The Vatican just announced that Islam has surpassed Roman Catholicism as the world's largest religion. Catholics make up 17.4 percent of the world population but Muslims make up 19.2 percent (all Christians, including Catholics, make up 33 percent of the world population).